I photographed this worker in the grounds of the lovely Botanical Gardens in Kolkata, India. Have you ever wondered how to photograph an Environmental Portrait that depicts someone in an environment in which they seem to belong? Here’s the recipe for how I go about making beautiful, life affirming Environmental Portraits that explore the Human Condition. I made the above photo of a worker in the Botanical Gardens in Kolkata (i.e., Calcutta), India. It looks very much like a clearing in the jungle when in fact the gardens are in the middle of one of the world’s largest cities. But this is not England and there are parts of these gardens that do evoke a sense of the wild. Photographing an interesting person in an environment to which they seem to belong makes for a compelling image. This style of photography is commonly referred to as an Environmental Portrait. When constructing an Environmental Portrait it’s important to compose your image around two essential elements: the portrait and the surrounding environment. The way to achieve this is simple. Move in close with a wide angle lens. The trick is to stand close enough so that the person in question is clearly identifiable while, at the same time, ensure you’re able to include a sufficient amount of their environment to better tell the story. Of course lens choice is only the beginning. Just as important as the focal length is the way you use it. Under normal circumstances the closer you get to the subject the more dominant your subject will become, yet the more of the background that will be excluded from your composition. 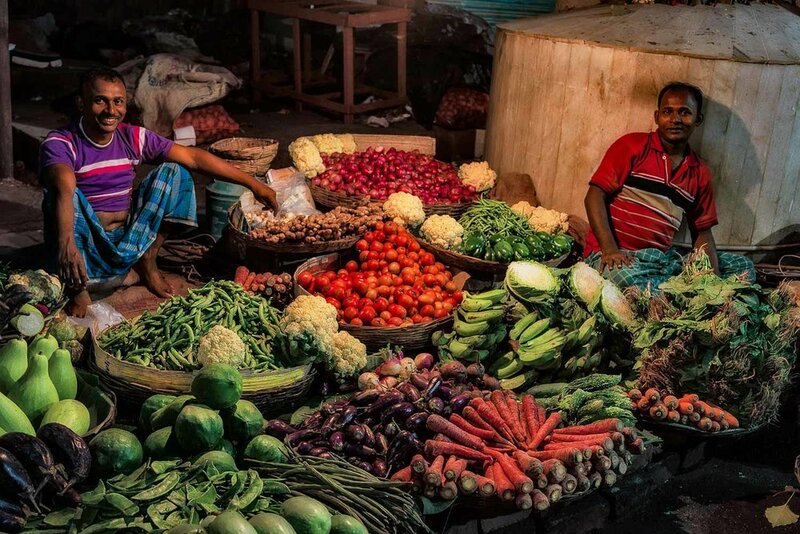 Environmental Portrait of a shopkeeper in his tiny, colorful shop in Kolkata, India. What’s The Ideal Lens For An Environmental Portrait? That’s the beauty of a mild wide-angle lens (e.g., 35 mm on a full frame camera) as it’s wider angle of view will include more of the surroundings (i.e., above, below, left and right) than would be the case with a normal or telephoto focal length lens. A mild wide-angle lens always possesses are quite special property when it comes to photographing the average face. When employed relatively close to your subject it acts to draw the face in a relatively flattering manner, while providing a sense of greater separation between the subject and the background than would be the case with a normal (e.g., 50 mm on a full frame sensor) focal length. This slightly more dramatic perspective can produce a more visually arresting image. That’s not to say you can’t make even more visually dynamic Environmental Portraits with focal lengths wider than 35 mm. You certainly can, but it’s a balance between producing a pleasing likeness of your subject, the perspective and how much of the surroundings are included in the frame that determines the success of your image. An environmental portrait of a young boy standing in the doorway of his home in the village of Maria Purem on the outskirts of Chennai, India. Why Do You Want To Make The Photo? If you’re looking to sell the image to your subject or their mother the mild wide-angle focal length is usually the best option. If, however, you’re producing images for a wider audience (e.g., photojournalist) than you might be better off employing a wider focal length for a more edgy look. So, by selecting a mild wide-angle focal length and moving up close to your subject, you can tell the story better by depicting your subject in an environment to which they seem to belong in a flattering, yet visually interesting way. Environmental Portrait of a taxi driver at rest in the back streets of Kolkata, India. How Much Blur Is Best In An Environmental Portrait? Generally speaking you’ll want to blur the background in a portrait photo. However, as the subjects surroundings are important to the story being told in an Environmental Portrait, you may choose to gently blur, rather than obliterate the background. While a fast lens is always appealing, the fact that you’ll often want to retain a reasonable degree of information in the background of many of your environmental portraits, might mean that a more modest maximum aperture (e.g., f/4) may be sufficient for your needs. And don’t forget that by moving in closer to your subject you’ll be creating a more shallow Depth Of Field. The above photo of a taxi driver at rest in the back streets of Kolkata illustrates this point perfectly. A relatively modest aperture of f/4 was used to make this image. We’re drawn to the sharpest parts of this image, his face, yet we can still make out important elements in his surroundings, that help tell the story, without needing to linger on them. And check out the lovely bokeh (i.e., quality/shape of the out of focus highlights) in the top left hand corner of the frame. A further tip is to place your subject off centre. If they’re in the middle of the frame they’ll likely be blocking the background and, as a consequence, much of the environment. This photos in this post are part of my updated India Photography Collection. There are currently over 50 photos in the collection and more will be added over time. You’ll notice the collection includes portrait, landscape, architecture and religious subject matter. India is a tough place to travel around. But it’s an incredibly vibrant country with opportunities for great photos around every corner.